Classic apple strudel is surprisingly easy to make. This old-fashioned, traditional Viennese apple strudel (Altwiener apfelstrudel) recipe contains simple ingredients, like apples, raisins, sugar, and cinnamon and is encased in a thin sheet of unleavened dough. This strudel is perfect all alone on a plate but tastes even better, with some vanilla sauce, whipped cream, or a scoop of vanilla ice cream. This recipe uses a homemade dough instead of store-bought filo pastry dough. The noodle-like dough recipe is just as easy (or easier) to use and tastes way better than store-bought. Even though the steps to perfect apple strudel are easy, one thing you will need for this recipe is time and patience. Place the flour in a bowl with the salt and add the water, then 2 tablespoons oil. Stir with a spoon until it comes together and you can work it with your hands. Knead the dough until it is smooth and tacky, but not sticky, about 5 minutes. If you need to add more flour, add only 1 teaspoon at a time. Form the dough into a smooth ball, brush it with 1 teaspoon oil and place it back in the bowl for 1 hour at room temperature. Covering the dough with plastic wrap is fine, too. Heat 7 tablespoons butter in a pan until foaming and add the breadcrumbs. Toast them, stirring constantly, until they are medium brown. Let cool. Soak the raisins in the optional rum (or orange juice). You can heat them for 30 seconds in the microwave and then soak them until you are ready for them. Peel, core and chop the apples into small pieces. Add the sugar, lemon juice, lemon zest, raisins, and cinnamon and mix well. Roll out the dough on a lightly floured board to about 13 by 9 inches. Lightly flour a clean towel with no nap, place it over the dough, grab both (towel and dough) and flip over. Straighten both, as necessary. Using your hands, gently stretch the dough thinner on all sides, working your way around the sheet of dough. Stretch it until it starts to look translucent in spots. Let it rest a minute and again stretch the areas you think are too thick. Thick edges can't be avoided and will be cut off. Brush dough with melted butter. Spread the breadcrumbs over 2/3 of the dough and pat down evenly. Drain the apples and spread them over the other 1/3 of the dough. Cut off any thick edges of dough with kitchen shears. Using the towel, fold one side of the dough over the filling. Brush exposed dough with melted butter. Fold in ends of dough like an envelope (or burrito). Fold the other side of dough up and over filling to form a roll. Brush with butter. Use the towel to maneuver strudel to a baking sheet lined with parchment paper. Roll strudel onto parchment paper so that the seam-side is down. Brush with melted butter. Heat oven to 400 F. Bake for 20 minutes and then reduce heat to 350 F and bake for an additional 40 to 60 minutes. Remove from oven, brush top with melted butter and sprinkle with confectioners' sugar while still warm. Transfer to a serving platter with a large spatula (or two). Cut into 1 1/2-inch-wide slices with a bread knife or serrated knife and serve with your choice of whipped cream, vanilla sauce, or vanilla ice cream. 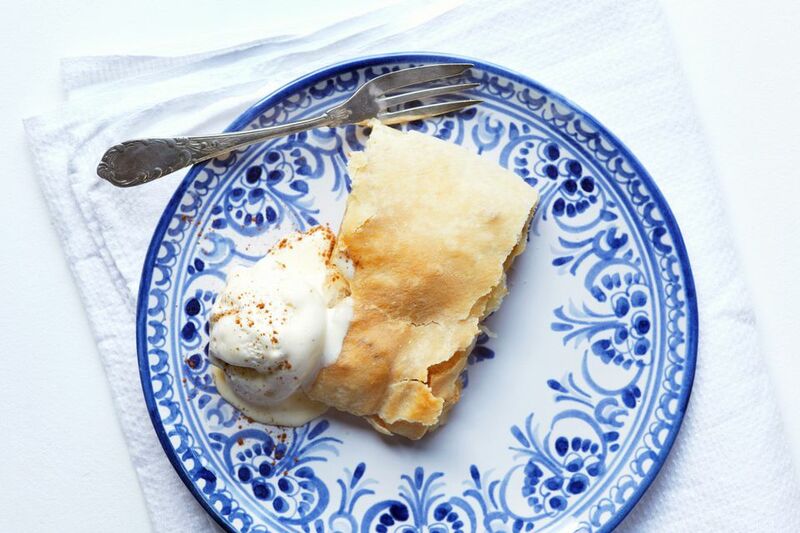 Practice making strudel BEFORE you want to serve it, at least once before the big day. Err on the side of thicker dough. If you stretch it too thin (you know, Oma always says you should be able to read a newspaper through it!) before you add the filling, when you roll it, you will stretch it more and it might tear. Tearing causes the liquid to evaporate when baked, instead of steaming inside the package. It won't ruin your strudel, but it will not be perfect. If you are planning to serve the strudel the next day, leave it on parchment paper and cover loosely with a clean kitchen towel. Place out of reach. Recrisp in the oven. Warming in a microwave does not produce the best results.